On Sunday, Nov. 18, the Pike Road Arts Council drew a crowd to Town Hall with the help of celebrated artist and Pike Road & The Waters resident, Carl Calderone. 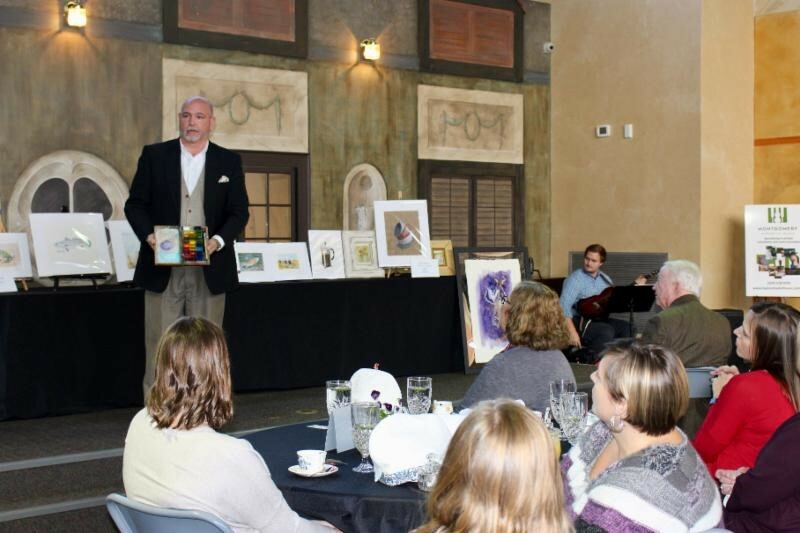 As the audience enjoyed scones, finger sandwiches and tea provided, Carl shared the story of his artistic journey. He noted three things that impacted his art the most: his father, his surroundings (he has lived in over 30 different places!) and the strong women in his life. Carl specializes in watercolors and paints everything from greeting cards for family and friends to large, vibrant pieces that reflect his love for jazz music. Tickets are available now for the Jan. 13, 2019 Art Talk & Afternoon Tea, featuring artist Barbara Davis. Seating is limited, so follow this link to learn more or purchase a ticket today! While you’re here, check out our listings!